The European Values Study (EVS) is a large-scale, cross-national survey on basic human values that has been conducted every nine years since 1981. With more than 47 participating countries, the EVS is the most comprehensive research project on human values in Europe. It provides unique insights into the ideas, beliefs, preferences, attitudes, values and opinions of citizens throughout Europe. From 1981 to 2008, four survey waves were conducted in European and other countries. 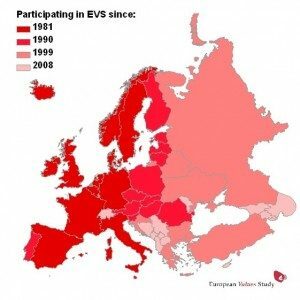 The surveys explore value differences, similarities and value changes among citizens of the EVS member countries. The collected data enables comparisons both over time and space and can also be combined with the data of the World Values ​​Survey. This offers the possibility to compare data from 113 world regions over a period of more than 35 years. Switzerland participated in the study for the third time in 2017 (after 1990 and 2008). The planning and execution of the survey in Switzerland is funded by the Swiss National Science Foundation (SNSF). The 2017 survey was carried out both in the form of face-to-face interviews and as a (self-administered) online questionnaire with a gross sample of 8,400 respondents. Provide the scientific community with a platform that offers free access to a vast amount of high-level data and offers the possibility for the exchange of knowledge. Initiated by the European Value Systems Study Group (informal group of academics) in the late 1970s, the EVS Foundation is coordinated by the Faculty of Social and Behavioural Sciences at the Tilburg University in the Netherlands. The Foundation’s international board members are responsible for negotiations with funding agencies and the planning and promotion of joint activities. The Council of Program Directors manages the EVS project and authorises the general programme of the study, the final questionnaire and the survey method. The EVS Executive Committee is responsible for day-to-day operations. The Theory Group is responsible for designing the initial questionnaire and the Methodology Group is responsible for the project’s quality assurance. In Switzerland, FORS is responsible for directing the survey. Under the lead of Michèle Ernst Staehli, the Swiss EVS team has the following responsibilities: translation of the English source questionnaire into three national languages (French, German and Italian), sample drawing for Switzerland, development of specific survey methods, cleaning, processing and documentation of the Swiss EVS data. The fieldwork is carried out by a specialised agency. In Switzerland, the EVS is funded by the Swiss National Science Foundation (SNSF). The respondents are drawn from a probabilistic sample representing the countries’ population aged 18 and above. The 2017 survey wave was carried out both face-to-face (CAPI) and online (self-administered, CAWI) with a gross sample of 8,400 respondents. Since the EVS is considered a survey of national importance to Switzerland, a sample of individuals can be drawn randomly from the sampling register of the Swiss Federal Statistical Office in accordance with Art. 13c, para. 2, lett. d, of the Ordinance on the Execution of Federal Statistical Surveys dated 30 June 1993. The European Values Study covers a wide range of human values. In 1981 and 1990, the study covered already a broad range of topics concerning family and sexuality, work and leisure time, religion, politics, and ethics. In the third wave in 1999, new topics such as solidarity, social capital, democracy, and work ethics were included. In the last wave in 2008, the survey questions focused on a broad range of values and aimed at assuring the comparability across the different waves. After completion of the fieldwork, FORS reviews and verifies the data and processes it, so it can be integrated into the central data archive of the EVS. The anonymised EVS datasets are freely available to researchers and other interested people after registration and agreement to the data use conditions. The Swiss EVS data is also available on the FORSbase data catalogue. The associated documentation is available in French and German. To facilitate time series analysis, the EVS Longitudinal Data File 1981-2008 was created. For comparisons at the international level, this data file can easily be combined with the World Values Surveys Longitudinal Data File 1981-2014. The resulting Integrated Values Surveys 1981-2014 cover surveys conducted in 113 countries/regions. EVS Longitudinal Data File 1981-2008: Cumulative dataset based on the four EVS waves 1981, 1990, 1999, and 2008 (48 countries/regions). Integrated Values Surveys 1981-2014: Guideline on how to create a data file that includes the four EVS waves and the six WVS waves (113 countries/regions). Researchers are requested to respect the data use conditions, in particular the proper citation in articles or other types of publication. All publications that reference the data must be communicated to the EVS bibliography. The international data and the associated documentation are available free of charge from the GESIS Data Archive. The European Values Study website provides additional information on the origin and organisation of the study, on the participating countries, the research topics, and the questionnaires. The EVS Repository provides an overview of all publications that use EVS data. Publications that use the Swiss survey data must be reported to the FORS International Surveys team. Today, the EVS study spans a full generation, revealing value changes on topics such as homosexuality and working moms, but also demonstrating firm European traditions, for example the belief in democracy and the rejection of bribery. Since the beginning of the project, a rich academic literature on values has been created: The EVS bibliography presently contains more than 1,500 publications. Most of these are in English, but other languages are also available. For more information, please consult the EVS bibliography. This Atlas is the result of the European Values Study. It covers all European nations from Iceland to Turkey, and from Portugal to Russia. It graphically illustrates the rich diversity of values and beliefs of the more than 800 million Europeans living inside and outside the European Union today.